Look what I found in my long neglected blog email -- just a month late! My family and I spent Thanksgiving in a small rental cottage in Venice Beach. Despite the minimally stocked kitchen, my children and I decided to make your beef roast, which has become a family favorite. 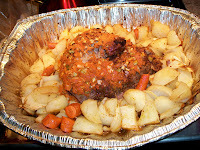 We had to skip the puree and used chopped vegetables instead, and we roasted the beef in a foil disposable pan. The meat is kosher and turned out beautifully. Thank you for sharing the best roast recipe I have ever made. The first photo is of me and my son's girlfriend before we put the roast into the oven. The second is the beautiful roast. Click here for the Printer Friendly Recipe to appreciate what a great feat Laura and her kitchen crew managed to perform, in a beach house kitchen no less - without a food processor! Now that's cooking! 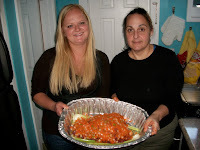 Thanks to Laura for reading my blog, for cooking this amazing roast and for being fearless in the kitchen. And big thanks for sending the note and the pictures. You did yourself proud -- and me too! Those girls were determined! Looks yummy! This gives us all more motivation to cook proudly and always have a camera handy. What great trophies to have ... pictures of accomplishments that were devoured to prove they were fantastic!